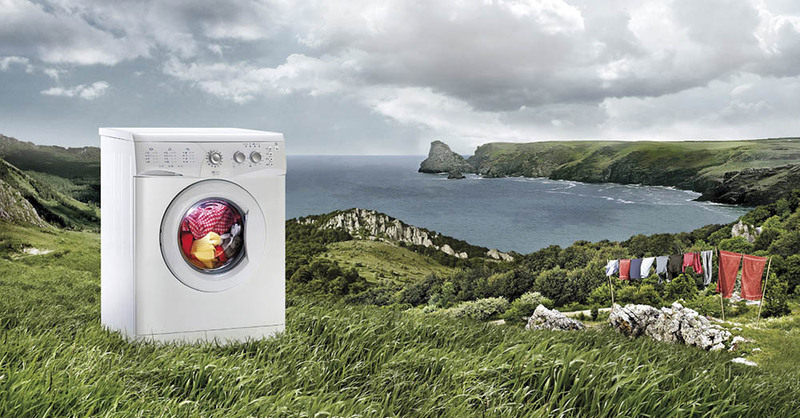 5 Ideas - Upcycling Your Old Washing Machine Into Something Amazing! 5 way to upcycle your old washing machine and WOW your friends! Really simple and super effective. Simply extract the drum from your old washing machine, add a coat of primer and paint your desired colour. Be sure to use a paint suitable for the outside and if you want the rustic look, give the surface a light sanding. D2H Tip: As an extra benefit the existing holes in the drum will provide excellent drainage ensuring you can never overwater your plant. Who doesn’t love a fire pit? Especially as the nights draw in and the temperature drops. 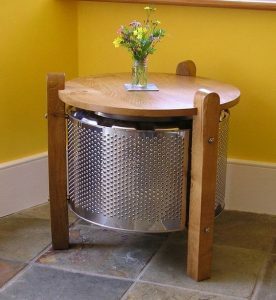 Again a dead simple method to putting this together, simply extract the drum, attach three legs to take the pit off of the floor (Or use another sturdy base like an old alloy wheel perhaps?). 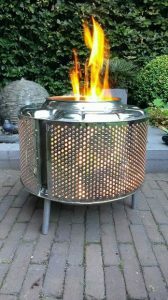 Fill with good quality dry firewood and light. D2H Tip: Best served with Marshmallows! This one, we admit needs a lot of work and prior planning but the finished look is outstanding. Make sure you use a strong, durable cable as it’s carrying a lot of weight and be sure to use a strong bulb to get maximum light diffusion. D2H Tip: Maybe best to leave this one to the professionals! 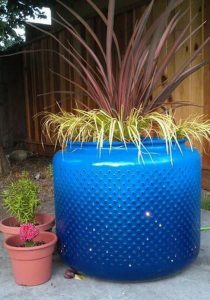 Another simple, yet effective use of your old washing machine drum. Simply extract the drum, attach some good quality legs using bolts and the existing drum fixings. Then add a circular timber top. Don’t worry if you can’t find a suitable timber top glass looks great too, simply pop down to your local glass manufacturer and ask for shaped glass. D2H Tip: Make sure to have the glass toughened and laminated for extra safety! Now, we know this is technically cheating but is still of vast importance! Meet WEEE Man, a product born from a collaboration between the Royal Society of Arts & Canon back in 2006 that now resides at the world-famous Eden Project in Cornwall. 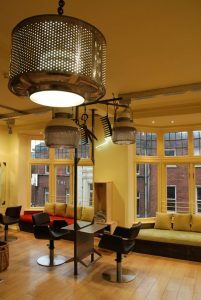 The purpose of this project was to demonstrate just how much of our waste electrical products disappear into landfill. 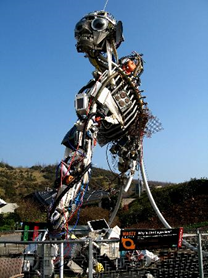 WEEE Man, standing at a little over 7 metres tall, weighing over three tonnes, represents what an average UK citizen throws away in their lifetime. You can learn a little more about WEEE Man here. So next time your appliance goes kaput, or you’re considering upgrading to a newer model – have a think about upcycling your old product. Our Pinterest is a great place to get the creative juices flowing and we look forward to sharing lots of ideas we like with you throughout the year. Let us know if you’re going to have a go at any of these projects. We look forward to seeing what you come up with! Another great idea is to turn the drum from the washing machine in to ottoman. Just polish the drum, add rounded seat on top and voala. Now you have an extra chair for your guests to use. Brilliant tip! Thanks for sharing!